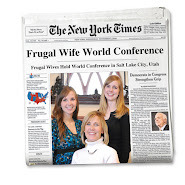 Are you living your life too fast to be frugal?? It's difficult to remove yourself from the frenzied pace of modern life. But try to slow it down, think things through, consider your options before you buy something, take a few deep breaths and spend your hard-earned money wisely. Your savings can be enormous. but at the same time, I need to prioritize budgeting! I certainly have enough time to plan before heading to the store, and printing coupons! Haha... I really like this, and it somehow strikes me as funny! Possibly because it flies in the face of such platitudes as "live in the moment" and "life's too short to ___", which, while true to some extent, are often used to justify reckless behavior. This is a great point.